When I step off the East By West ferry that has transported me from Wellington to Days Bay on the eastern side of Wellington harbour, I have a feeling of déjà vu. There’s a distinct south-east England coastal vibe, even a village named Eastbourne and the windswept Pencarrow coastline at the entrance of the harbour reminds me of the Southern Downs. Chocolate Dayz Cafe is one of a few cafes in Days Bay and affords superb views towards Wellington and has indoor and outdoor seating. Believe it or not, this place is famous for it’s cheese and date scones that are usually sold out by 11am. I nab a gigantic date scone that is so loaded with dates that it’s a wonder that flour has been used at all. Usually served with butter, I ask whether I can have jam and cream, which is not a problem and subsequently am asked whether I want it heated or at room temperature. The scone is nothing short of sensational – bursting with flavour, moist and wholesome. The cream is thickly whipped and the jam is housemade although a bit sugary. 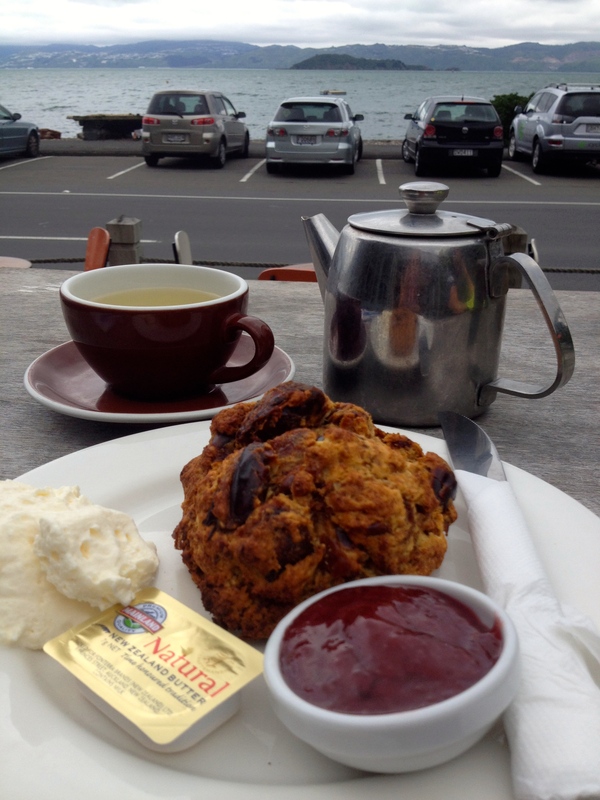 Surely with scones and vistas like this, a visit to Wellington is not complete without a day trip to the other side of the bay. Tea: A selection of New Zealand t-leaf T loose-leaf tea served in an adequate sized pot. Overall: A sensational spot looking over the bay towards Wellington.